The films were produced by Billy Klüver and Julie Martin for E.A.T. and directed by Barbro Schultz Lundestam. Titles and titles sound were created by Robert Rauschenberg. In 1966 ten New York artists and thirty engineers and scientists from Bell Telephone Laboratories collaborated on a series of innovative dance, music and theater performances, 9 Evenings: Theatre & Engineering, held at the 69th Regiment Armory, New York City, in October 1966. The artists included are John Cage, Lucinda Childs, Öyvind Fahlström, Alex Hay, Deborah Hay, Steve Paxton, Yvonne Rainer, Robert Rauschenberg, David Tudor and Robert Whitman. Archival material has been assembled into ten films, each of which reconstructs the artist's original work and uses interviews with the artists, engineers and performers to illuminate the artistic, technical and historical aspects of the work. Open Score by Robert Rauschenberg is the first film to be released in a series that will bring to life a historic moment in contemporary art history. In the early 1960s I was working as a research scientist at Bell Telephone Laboratories in Murray Hill, NJ, but was also aware of the tremendous explosion in the arts that was taking place in New York City. I had worked with several artists - Bob Rauschenberg, Yvonne Rainer, Jasper Johns and John Cage - making it possible for them to use new technology in their works. I believed increasingly in the importance of artists having the opportunity to work together with engineers and scientists. At the beginning of 1966 an opportunity arose to make a series of artists' performances using new technology in collaboration with engineers and scientists at Bell Laboratories. 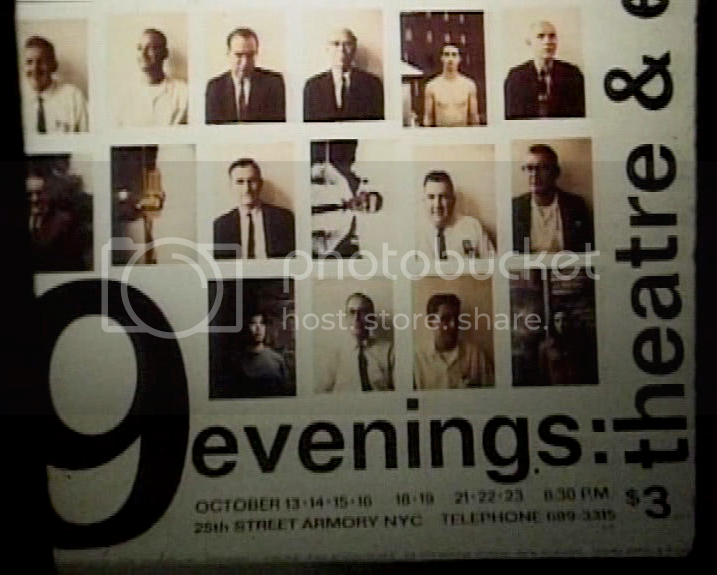 Rauschenberg and I made these collaborations the central focus of 9 Evenings: Theatre & Engineering, held October 13 to October 23, 1966, at the 69th Regiment Armory in New York City. We invited artist friends to participate: choreographers Lucinda Childs, Alex Hay, Deborah Hay, Steve Paxton, and Yvonne Rainer; composers John Cage and David Tudor; and artists who made theater pieces, Öyvind Fahlström and Robert Whitman. I recruited fellow engineers from Bell Laboratories to work on the project. At the first meeting between the artists and the engineers, I told the artists to ask for anything they wanted and the engineers to respond with suggestions on how to accomplish these ideas. Initially, Rauschenberg asked for: "Light-sensitive chemical which changes color; temperature and pressure sensitive colors; live fabrics; nowhere sound; use of time delay in general; printing on tape manually without using tape recorders; infrared TV...forms of rebroadcast, snooperscopes, TV sets, Eidophor." It was the infrared television that became a central element in Rauschenberg's piece. We needed to find television pickup tubes that operated in the infrared end of the spectrum. Engineer Larry Heilos quickly discovered that any good infrared equipment was held classified by the U.S. government. He solved the problem when he located a supplier in New Jersey who had an infrared videcon that was of Japanese make and could be installed in a Norelco video camera. We had found the 69th Regiment Armory on Lexington Avenue at 25th Street, which had been the site of the famous Armory show of 1913. Although the acoustics were terrible, it was a very exciting space and the artists liked the idea of its size. It would now be possible to reach a much larger audience than they had at Judson Church or at the downtown theater performance spaces. We moved into the Armory on October 8th, with only five days to the first performance. During the next five days we installed the electrical system for the stage lights and other equipment, laid miles of cable, installed the sound system and speakers in the balcony surrounding the central space, and set up the bleachers for the audience. There were endless conferences and the artists held rehearsals as best they could. Open Score was performed on October 14th. It began with a tennis game between Frank Stella and his tennis partner, Mimi Kanarek, on a full-scale court laid out on the Armory floor. 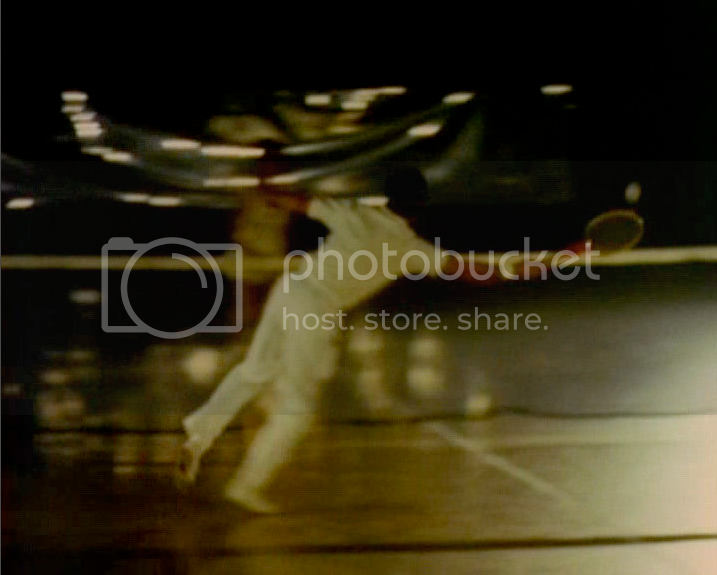 Rauschenberg had adopted one of the oldest forms of performance that everyone recognizes, a tennis match, and made it into dance. He also used the game "to control the lights and to perform as an orchestra." Each time Frank or Mimi hit the ball a loud BONG vibrated around the Armory and the sound of each BONG switched off one of the lights illuminating the court. Bill Kaminski at Bell Laboratories had designed a tiny crystal-controlled FM transmitter that could fit in the handle of the tennis racquet. A contact microphone was placed at the top of the handle and the antenna for the transmitter was wound around the racquet head. When the ball hit the racquet, the vibrations of the strings were picked up by the contact microphone and transmitted to an FM radio receiver, amplified, and fed to the speakers, resulting in a loud BONG, which also turned off one of the lights. The game continued in the increasing darkness until the Armory was completely dark. Then a crowd of 500 people entered in the darkness. Lights with an infrared filter illuminated the crowd as the infrared sensitive television cameras picked up their movements. The television images were projected onto three large screens hanging in front of the audience. The audience could sense the presence of the crowd, but could only see them through the projected television image. Rauschenberg used banks of flashlights attached to the balcony railings to signal his cast to perform simple movements he had devised: "touch someone who is not touching you; hug someone quickly; move closer together; move apart; draw a rectangle in the air as high as you can reach; sing one of ten songs being sung loudly or sing one of your own choice, etc." At the end of this section, the house lights came up slowly and the crowd followed Rauschenberg's instructions to "remain fixed until the lights dim down and go completely out." Rauschenberg added a third section for his second performance on October 23rd. He had the crowd leave silently in the dark. Then a single spotlight picked up the shape of a girl in a cloth sack - Simone Forti - singing a Tuscan folk song she remembered from her childhood. Rauschenberg picked her up, carried her to another place on the Armory floor and put her down. He repeated this several times as she continued to sing.